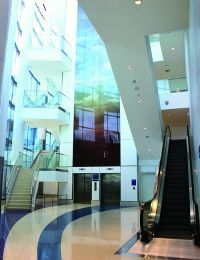 Most terminal connectors are simple structures—enclosed hallways without much additional utility or aesthetic flourish. The five-level connector that opened at Los Angeles International Airport (LAX) in 2016 is an entirely different story. The new, modern facility that joins Terminal 4 and the Tom Bradley International Terminal includes a checked baggage inspection system, an interline baggage transfer facility, its own TSA passenger checkpoint and a public plaza with outdoor seating. With 46 self-service bag drops operating in its terminals as of mid-October, Toronto Pearson International (YYZ) is on the fast track to expediting the check-in process for passengers flying out of Canada's biggest and busiest airport. Since YYZ debuted its first self-service bag drop stations in January 2016, travelers have chosen the automated option more than 3 million times. 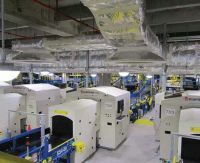 The new $29.4 million checked baggage facility at Westchester County Airport (HPN), near White Plains, NY, was in the design process for four years, but the delay was worth the wait. The new handling and screening system contains in-line explosives detection and is less costly to operate and maintain than similar systems at peer airports. A new $35 million baggage claim building at Philadelphia International (PHL) isn't just the final phase of the airport's $161 million Terminal F expansion; it's also a concrete example of how PHL is re-sculpting its facilities to adjust to changing market conditions. Mishandled bags cost the airlines money-lots of it. According to SITA's most recent annual Baggage Report, there are approximately 6.5 mishandled bags per every 1,000 passengers, for a total of 23.1 million mishandled bags annually. Skift Magazine reports that baggage snafus cost the airlines an estimated $2.3 billion in 2015. When Calgary International Airport (YYC) in Alberta opens the doors to its new International Terminal later this year, a new baggage handling system will be among its notable features. The system is designed to run faster, use less energy and facilitate better bag tracking. Importantly, it will also eliminate the need for passengers on connecting flights to claim and recheck their bags. 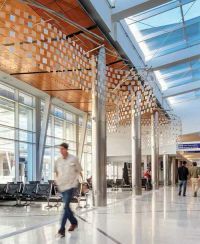 This summer, Milwaukee's General Mitchell International Airport (MKE) cut the ribbon on a newly renovated baggage claim building. The $45 million project stripped the airport's 1950s structure down to its bones and raised up a more open, spacious and light-filled facility - a fitting complement to the inline baggage handling system completed last summer (see Sept. 2015 issue of Airport Improvement for more details). The ticketing lobby at Milwaukee's General Mitchell International Airport (MKE) is once again more open and spacious. Gone are the seven SUV-sized explosives detection system machines that invaded the entry space after 9/11 changed screening requirements. And travelers no longer have to maneuver their luggage to the large, intimidating machines. Recent enhancements to baggage handling at Halifax Stanfield International Airport (YHZ) are setting new precedents for efficiency in the front of the house and behind the scenes. A fully automated self-service baggage drop is the first of its kind in North America; and associated backroom systems have more than tripled the Nova Scotia airport’s overall handling capacity. A new baggage handling system designed to accommodate an expected traffic bump at Dallas Love Field Airport (DAL) is a key component of the airport's $500+ million modernization program slated for completion in October. 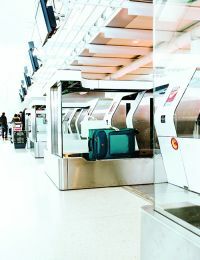 Passengers connecting to U.S. destinations in Terminal 1 at Toronto Pearson International Airport (YYZ) no longer have the hassle of claiming and rechecking their baggage, thanks to the airport's new multimillion-dollar baggage system. The Baggage Image and Weight Identification System (BIWIS), which streamlines the Customs process by capturing image and weight information for each bag inducted into the system, went live in January. It's hard to overestimate the importance of a good baggage claim system. According to Jim Gaz, senior director of travel and entertainment at J.D. Power and Associates, "Baggage claim has the greatest impact on overall satisfaction, along with airport accessibility." The 2010 J.D. Power airport satisfaction survey found that passengers will tolerate 17 minutes of wait time at Baggage Claim and Security before satisfaction drops to low levels; and every additional five minutes of waiting decreases satisfaction as much as 12 index points. From automated teller machines for cash to scan-it-yourself checkout lanes at the supermarket, consumers are accustomed to self-serve options. Montréal-Pierre Elliott Trudeau International Airport (YUL) is giving air travelers just that. With one of the busiest checked baggage systems in the country, baggage handling is a critical component to overall operations at Orlando International Airport (MCO). During Florida's peak tourism season, outbound volume ratchets up to 54,000 pieces per day, with influential customers including Walt Disney World, Carnival Cruise Lines, Orange County Convention Center and Rosen Shingle Creek Resort contributing to the volume. After Southwest Airlines acquired AirTran Airways last year, its Checked Baggage Inspection System (CBIS) at Baltimore/Washington International Thurgood Marshall Airport (BWI) went from taxed to overloaded. "Our flights peak at 199 flights per day, and AirTran was running 48 flights per day," recalls Jimmy Dickerson, manager of federal airport security technology for Southwest. "Our CBIS could not by itself handle the combined baggage for the two carriers." The Airport Integration Test Lab was officially inaugurated at Vic Thompson Company (VTC) headquarters in Arlington, TX, in October to offer objective third-party testing of baggage systems and passenger screening in an operationally realistic environment. Elements of the 1 million-square-foot baggage handling system that began operating in Terminal A at Dallas/Fort Worth International Airport (DFW) last May could start appearing in other airports throughout the nation. In addition to eliciting compliments from passengers and the firms involved with the project, the new system received the ultimate nod: TSA plans to use it as a prototype for how other airports should model their in-line systems. As a key transit point for cruise ship passengers, Fort Lauderdale-Hollywood International Airport (FLL) experiences pronounced surges in traffic January through April. Previously, the seasonal peaks taxed its baggage handling capacity - primarily due to the slow, cumbersome outbound baggage handling system (BHS) in Terminal 1. When news of possible self-tagging for baggage first broke, some commentators poked fun at the idea. "What's next?" quipped one broadcaster. "Are passengers going to be expected to fuel the aircraft?" Tampa International Airport (TPA) is known for exceeding passenger expectations. Frequent flyers participating in the 2010 Zagat Survey voted it their second favorite U.S. airport, and J.D. Power and Associates' 2010 North American Airport Satisfaction Survey ranked it No. 3 among medium-sized airport. Nashville International Airport's New Year's resolution is to have its $32 million integrated baggage handling and security screening system vetted and approved for use in early 2011. A new high-speed inline baggage handling system at Kahului Airport (OGG) is the first of its kind in Hawaii, and among the first in the United States to be completed with federal stimulus funds.